Spring is known for it’s changeable weather, and in Victoria, we like to take this to extremes. The recent Melbourne Cup long weekend was an excellent example of this yearly phenomenon. It was balmy and humid one minute, before temperatures dipped to cold, crisp and cloudy conditions. It won’t surprise you to hear then, that as a fashion loving Victorian, I find it’s necessary to have a range of wardrobe options available at the ready. For me, one of the most handy styles for this time of year is the long sleeved frock. The frock factor gives me a taste of Summer, while the sleeves are a concession to the fact that it can still be pretty fresh – either during or either end of the day. I fell in love with this pretty Paradiso print on sight – it’s statement navy, pink and tan colour way working for me on all levels. 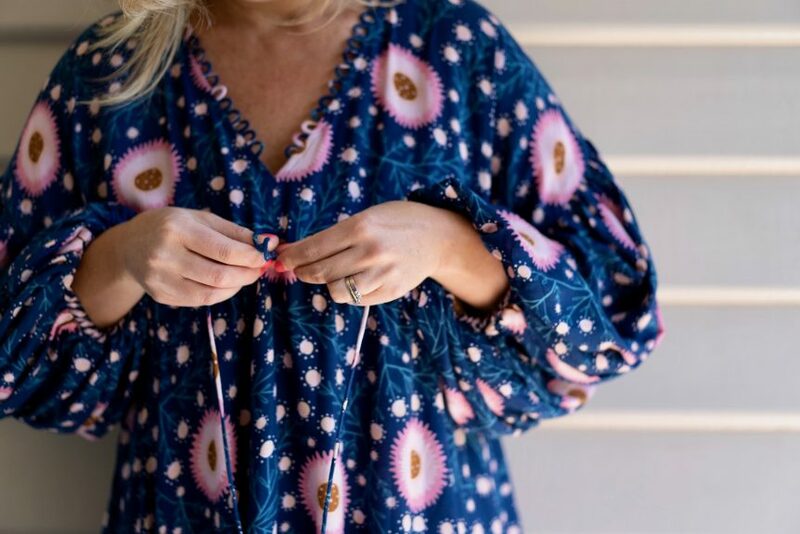 Added to this gorgeous statement print are some delicate details – hello tassels, drawstring seam, embellished V neck and billowy sleeves – which take this casual dress to another level. In terms of sizing, I generally find Bohemian Traders dresses on the generous size and that is certainly the case with this style. I’m wearing a Medium which is a relaxed, roomy fit on me – perfect for days when you don’t want the cling factor. I am tall though (175cm) and the high low hem does come up quite a way above my knee – shorter than I’d normally go for – which you can see in the photo above. While I usually wouldn’t mind a bit of additional length, I think the shorter hemline works given the relaxed style and fit of this dress. 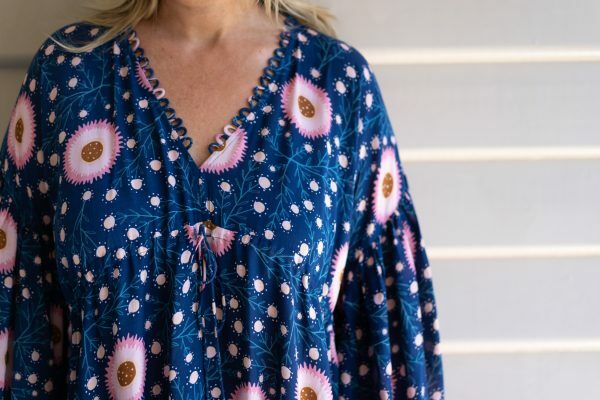 If you’re a fan of this print but not of this style, you’ll be pleased to hear that you there is are two short sleeved dresses, a couple of tops, skirt and a maxi dress also in this print as well as some gorgeous girls’ clothing. Check out the full Paradiso range here. Finally, can we take a moment to ponder the loveliness of ALYCE wedges in navy? As many of you may know, I LOVE this style and wear my ALYCE wedges in tan with everything over the warmer months. I think I’ll be getting plenty of wear from my new navy wedges now too. I love that these wedges give height and that lovely relaxed boho vibe with the espadrille element but are comfy enough to wear out and about and – most importantly – on the dance floor! In terms of sizing, I find this style true to size and wear my usual size 40/9. This post contains affiliate links. You don’t pay any extra but I earn a small commission. For more info, please check out my Disclosure policy here. What’s your go style of long sleeved dress? Are you on board the espadrille wedge train?